Jazz is historically considered an urban music. The first jazz bands were in cities like New Orleans, moving north to Kansas City, Chicago, Detroit, New York, incorporating the sounds of the many cultures that merged as immigrants and travelers came together. Bluegrass, like jazz, is a “roots music” with a greater foundation in Western European traditions and more often associated with a less urbane environment. Both genres depend to a lesser or greater degree on improvisation, but where jazz generally swings, bluegrass generally strings—the blend of multiple strings (guitars, banjo, mandolin, bass) giving it a distinctive sound regardless of the melody. That’s really the sum total of my knowledge of bluegrass. And at that, I suspect it is faulty. I was nevertheless intrigued by an email announcement from my old friend John Penny, a guitarist and composer, and recently vocalist, who like me moved to the Twin Cities from Iowa City in the early 70s. We go back to about 5th grade. Iowa City High School Class of ’68. Go Little Hawks! (Don’t do the math. Just leave it.) 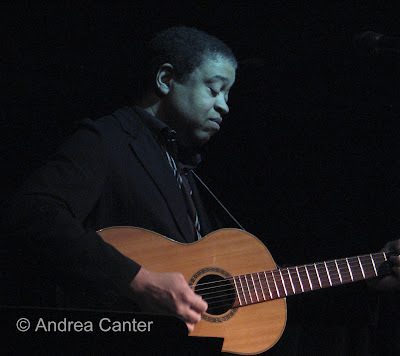 John has been involved in many music projects, largely jazz and Brazilian, but some bluegrass as well. His email announced a special gig at Munkabeans Coffee in Hopkins, where he has previously performed with his trio. This time, he was appearing with KBEM broadcaster and sometimes bluegrass musician Kevin Barnes, and special guest Josh Pinkham, whom he described as a young mandolin phenom from Miami. I looked up Josh on the Internet—he’s a veteran of ten years playing festivals and concerts all over the country and now all over the world. He plays bluegrass, jazz, classical. He also plays violin. Turns out John lives next door (in Golden Valley) to Josh’s girlfriend’s parents. They connected the strings, knowing Josh would be visiting this weekend. Soon the gig was scheduled. We think musicians all know of each other but sometimes it is just serendipity—who lives next door. John and Kevin had been wanting to play together but the opportunity never came up til now. Munkabeans (under a new owner now, it was once the Sunshine Café) sits on Mainstreet in downtown Hopkins. There’s some large comfy chairs, a few formica tables and kitchen chairs, a counter covered in home-baked cookies and muffins and all types of teas and coffee. They have a few pots of home-brewed soups, bread baking in the oven, sandwiches made to order, ice cream and malts—which apparently are a signature item that most patrons order even when it is 15 degrees below zero outside. And there is a small area set aside for music. John on acoustic guitar, Kevin on doboro—a resonator guitar played flat, and Mark Shaefer, sitting in on violin, started out the evening. I know it’s bluegrass, and that’s about all I know until the distinctive vamp of “All Blues” rises to the top. Miles Davis is everywhere! There’s no way to miss the virtuosity of these guys no matter what the rhythm or melody, and much of it seems improvised. Josh arrived late, fighting off a virus but determined to play tonight. Like most live jazz gigs I attend, especially those in small bars and galleries, there’s a lot of “planning” on the spot—what key, what chords, who comes in when. And then it all works like they’ve been playing together for years. By now Munkabeans was overflowing, many came in, few left, half were standing. Most were listening. As a quartet they played three or four bluegrass tunes. But then Josh called “Billie’s Bounce.” Maybe it never bounced so much! Four strings give bebop a very different sound, yet the essence of Charlie Parker remains. The mandolin twisted and turned as if a high-pitched saxophone rustling in the breeze. Next, “Summertime,” which seemed quite logical as a vehicle for strings and strings. Finally, his cohorts stepped aside to give Josh a solo spotlight. He wanted to play some Bach. Here we were, half standing, gripping our coffee mugs and malt cups, 30 or so crammed into a small town (or suburban, depending on your definition) cafe, applauding a Bach Partita (one known as “the jig”), played with eloquence and technical aplomb by a 21-year-old mandolinist from Miami. This coming week, I’ll be at Ordway to hear one of the world’s greatest working string chamber ensembles, the Takacs Quartet. They’ll play Haydn, Beethoven and Shostokovich to an audience of about 1500 in one of the premiere concert halls of the Midwest. I’ll surely enjoy it. But maybe not as much as a night of Parker, Gershwin and Bach, played for an audience of 30-40 by a pick-up string quartet in a Hopkins coffeehouse.